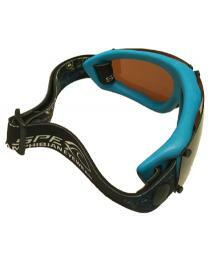 Spex Amphibian Eyewear Amphibious Floating Goggles, polarized floating eye wear designed for active sports. The frame is a unique rubber material that has stretch and flex to conform to any face with a comfortable fit. 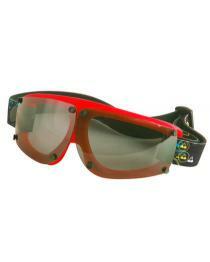 The lenses are polarized, removable, and replaceable. Best of all, these goggles float and will not sink to the bottom of the lake. Use for the WATER: water sk, wakeboard, wind surf, jet ski, river rafting, ocean surfing, Kiteboard, and Boating. Use on LAND: Snowboard, Skiing, Cycling, Dirt Bike, Motorcycle Riding. Use in the AIR: Helicopter Search & Rescue, Hang Gliding, Para Sailing. Worthy of the name amphibian. Spex are available in 7 different frame colors and different lens tints for different light conditions. Lenses choices include Polarized Grey, Polarized Amber or Non-Polarized Clear. 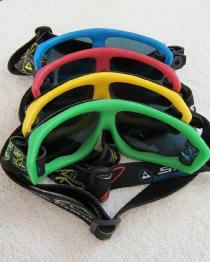 Polarized lenses offer UV Protection and reduced glare. Carrying case included. SPEX® are a HYBRID DESIGN combining the best features of sunglasses and goggles into one product and are ideal for contact lens wearers. The frame is made from a super strong, lightweight material called FLOATRON™ which conforms to the shape of any face and FLOATS! SPEX® can be used in a variety of sports including...WATER: Personal Watercraft, Waterski, Surf, Windsurf, Kiteboard, Boating...LAND: Snowboard, Skiing, Cycling, Motorcycle Riding...AIR: Helicopter Search & Rescue, Hang Gliding, Para Sailing... Spex Amphibian Eyewear are the original water sports goggle - Since 1989 - and are still 100% Made in USA. AVAILABLE IN POLARIZED GREY (Smoke). Other tints are special order. 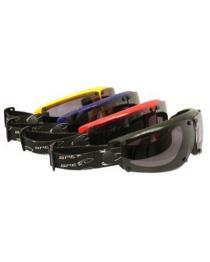 SPEX® AMPHIBIOUS EYEWEAR are available in 6 frame colors with your choice of Lens Tint (Grey, Olive, Amber or Clear). SPEX® come complete with a replaceable strap, vented carry bag and stickers and are 100% Made in the USA. The SPEX® frame is made of Floatron™ which is super soft, flexible, extremely durable, lightweight and best of all it FLOATS! This One-Size Fits-All frame conforms to the shape of any face. SPEX® lenses are POLARIZED as well as Interchangeable and Replaceable. 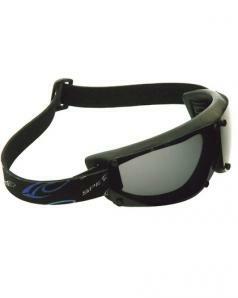 Polarization is ideal for water sports because it eliminates reflective glare. Polarized Lenses also offer 100% UVA, UVB and UVC protection and all SPEX® lenses have a hydrophobic coating to reduce waterspots and are hard coated to resist scratches. We also offer a special anti-fog solution called PRIMORDIAL OOZE™ that further reduces water spots and fogging. With your choice of 4 different lens tints, you can customize the eyewear for variable lighting conditions or personal taste. The adjustable neoprene strap fits snugly and comfortably and is also Interchangeable and Replaceable. 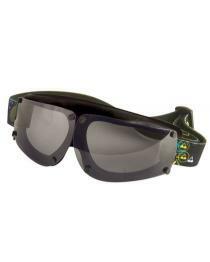 This modular design givesSPEX® AMPHIBIOUS EYEWEAR a long life span as you can replace components as needed.